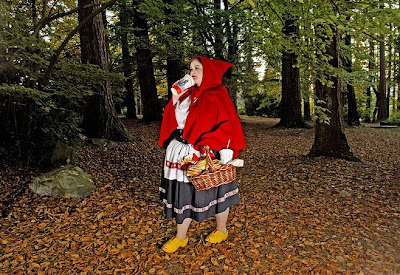 "These works place Fairy Tale characters in modern day scenarios. 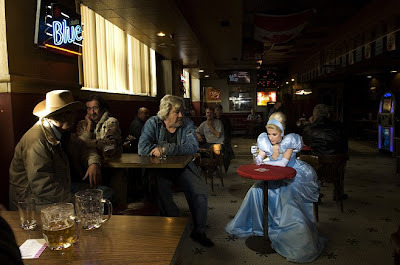 In all of the images the Princess is placed in an environment that articulates her conflict. 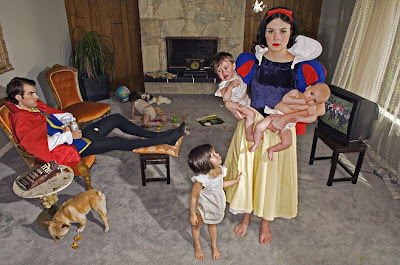 The '...happily ever after' is replaced with a realistic outcome and addresses current issues. The project was inspired by my observation of three-year-old girls, who were developing an interest in Disney's Fairy tales. As a new mother I have been able to get a close up look at the phenomenon of young girls fascinated with Princesses and their desire to dress up like them. The Disney versions almost always have sad beginning, with an overbearing female villain, and the end is predictably a happy one. The Prince usually saves the day and makes the victimized young beauty into a Princess. As a young girl, growing up abroad, I was not exposed to Fairy tales. These new discoveries lead to my fascination with the origins of Fairy tales. I explored the original brothers Grimm's stories and found that they have very dark and sometimes gruesome aspects, many of which were changed by Disney. 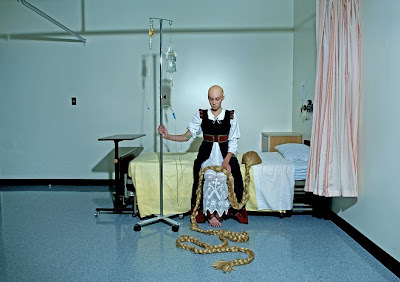 I began to imagine Disney's perfect Princesses juxtaposed with real issues that were affecting women around me, such as illness, addiction and self-image issues."